Model produced for Atlantis Submarines, a Vancouver based company that produces and sells passenger carrying submarines. The model is constructed of cast resin, vacuum formed plastics, and brass fittings. Overall model size is approximately 30" long x 10" high. Edmonton Science Centre Client: Beauchesne & Co.
Massing model with labels for orientation and educational uses in the plant's visitors centre. We were asked to do a full size mockup of a sixteenth century carronade. The exhibit was constructed such that part of the barrel could be lifted away to reveal and demonstrate how the device was charged for firing. 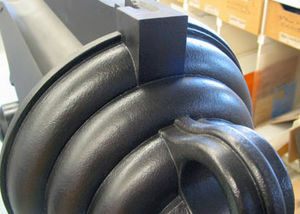 The materials used for the barrel were fiberglass over a framework of PVC and carved high density foam. 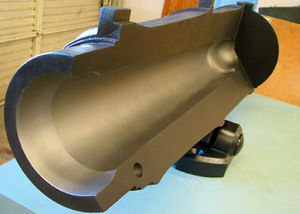 The lift-away section was constructed and then used to mold an all fiberglass part (to keep the weight down). The pivot and leveling mechanism is all machined metal.